A basic but powerful weapon with good range, damage, and ammo efficiency, but low rate of fire. Fires in spread pattern. The shotgun will fire without hostile targets nearby, can damage walls (it won't shoot over them) and other friendly structures, thus requiring significantly more caution when used, compared to most other weapons. The Shotgun is the earliest weapon capable of seriously assaulting Biter nests. The weapon's starting damage can pierce nest armor (12×5 vs. 2) and destroy them with moderate difficulty. Shotgun ammo represents a massive boost on resource efficiency, with 2 copper and 2 iron giving a stack of shells worth 600 raw damage. Contrast this against the pistol ammo, which costs 4 iron for 50 raw damage. These traits make the shotgun user friendly for sustained assaults against biter nests. 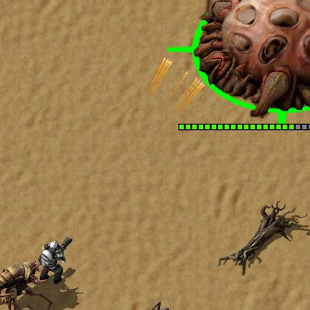 The shotgun is less effective in clearing out the biters themselves, because pellet spread will cause a nontrivial fraction of pellets to miss against small targets. Players can switch between the shotgun and SMG to balance power and resource-efficiency, or support themselves with covering fire from Turrets and combat bots.